The TMJ (temporomandibular joint) is one of, if not the most, complicated joints in the body. Your jaw joints connect the lower part of the jaw, the mandible, with the temporal bones of the skull on the right and left sides of the head. The jaw can hinge open and closed, as well as glide forward, backward, and from side to side. This broad range of motion is what lets us open and close our mouths in order to speak, chew, and yawn. 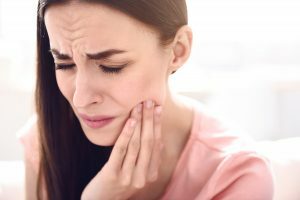 When problems arise with TMJ function, it can be extremely painful. TMJ dysfunction, sometimes abbreviated as TMJD, is characterized by pain and tenderness over and around the jaw, limited range of motion, clicking, popping, or grating noises during jaw movement, locking of the jaw, headaches, earaches, neck pain, and clenching or grinding of the teeth. Avoid hard to chew foods – giving your jaw and the muscles used for chewing a temporary break can help you to heal faster. Avoid foods that are difficult to bite into and chew (any hard, chewy, or very crunchy things like apples, corn on the cob, and chewing gum) and add in more soft foods that provide you with good nutritional value, like protein shakes, fruit smoothies, and hearty soups. Ice – applying ice to sore and tender temporomandibular joints can help to ease inflammation, reduce pain, and promote healing. Try icing your jaw for 10-15 minutes on each side to see if it can provide you with any relief. Relax – stress causes us to clench our teeth and tense up the muscles of the jaw. Making a conscious effort to relax your face, jaw, and lips can ease tension on the TMJ. Practicing relaxation techniques, which can include meditation, deep breathing, or yoga can help to reduce stress and promote relaxation. Moist heat – applying a heat pack to tight muscles can help them to release, reducing the pain and discomfort in your jaw. This can also help to relieve associated neck tension and headaches that often come along with TMJ disorders. Sleep position – generally speaking, sleeping on your back and side are preferred since those positions keep the neck and spine more neutrally aligned than sleeping on the stomach. For TMJD sufferers, sleeping on your back may be best since no pressure is placed on the jaw at all. You may also be less likely to grind your teeth at night if you’re able to sleep on your back. Yawning – opening your mouth wide to yawn can be problematic for people with TMJ issues. When you yawn, try keeping the tip of your tongue in contact with the roof of your mouth just behind your top front teeth. This can help to prevent over-extending the jaw, reducing the risk of your jaw locking open. Accidents – forces endured by the head and neck during an accident like a motor vehicle accident (even seemingly minor ones) can cause the atlas to misalign. Sports injuries – a slip on a wet, grassy field, heading a soccer ball, falling on the playground, colliding with another player, or taking a hit during football practice can all introduce enough force to cause the atlas to misalign. Repetitive use injury – these types of injuries have more to do with making the same repetitive movements or postures day in and day out rather than a single injury-causing event. Many jobs require repetitive motions (I.e. cutting hair, hanging drywall, teeth cleaning, typing, etc.) that can cause wear and tear on joints and cause vertebrae to misalign. When you understand how closely positioned the atlas vertebra is to the jaw joints on either side of your face, it becomes clear that even a slight misalignment of the atlas can be detrimental to normal jaw function. An atlas misalignment can cause unequal muscle tension affecting the ability of the jaw to move well and can also interfere with the normal nerve signals that coordinate jaw function. This close relationship also explains why many people suffering from TMJD also experience neck pain, headaches, and earaches as well – all of these factors can be influenced by abnormal atlas positioning. Adjustments are designed to hold in place for as long as possible. This is what allows us to accomplish lasting results. Corrections to the atlas are given only when found to be necessary, so the healing process can proceed as uninterrupted as possible. Adjustments are very gentle. Because we can be so precise, very little force is required to make the necessary correction. This is of particular benefit to our TMJ patients, who are likely already feeling pain or tenderness in the neck. We offer a complimentary consultation so that we can explore the details of your condition and explain how we might be able to help. If you have been dealing with jaw pain that gets in the way of your ability to function normally day-to-day, give us a call to learn more about how upper cervical chiropractic care can get you back on track.